Róisín Fitzpatrick is a leading contemporary Irish artist. 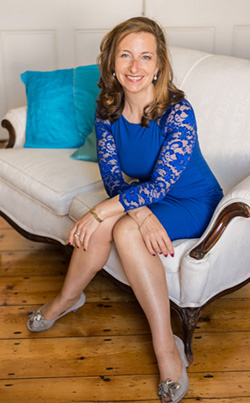 She is a graduate of Trinity College Dublin and the University of Geneva where she specialised in International Relations, speaking both French and Italian. Róisín worked for a short time at the European Commission and the United Nations before receiving a tenured position at the European Bank for Reconstruction and Development. 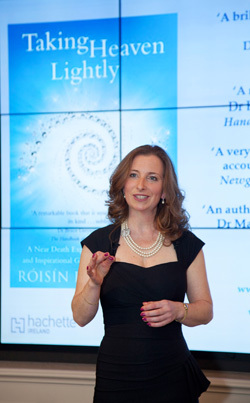 Later in her life, after overcoming a debilitating illness, brain haemorrhage and near-death experience, Róisín turned these adversities into a positive life change. Passionate about sharing the beauty of the light from her near-death experience, in a way that people can connect with their own inner light, she was inspired to create a series of artworks – the Artist of the Light collection. Róisín’s primary intention through this artwork, created with Swarovski Crystal hand-sewn on silk, is to enhance well-being in residential and corporate environments. She exhibits regularly on both sides of the Atlantic, with over ten exhibitions in the US over the past few years in Manhattan, Washington D.C. and the greater Boston area. Cahir O’Doherty, Arts' reporter for the Irish Voice writes "Fitzpatrick’s rise in the art world in New York has been nothing short of meteoric." Her solo exhibition at the Consulate General of Ireland in New York, was opened by Loretta Brennan Glucksman, Chairman Emeritus of the American Ireland Fund. Her exhibitions in Washington D.C. were opened by Ambassador Elizabeth Frawley Bagley and Ambassador Michael Collins, former Ambassador of Ireland to the United States. "Roisin's artworks are a great example of contemporary Irish art...thank you Roisin for bringing much needed light into our lives at this time when we risk being overwhelmed by darkness. Thank you for creating works of beauty and joy…Ireland is very proud of our rich culture and the work of our contemporary artists. It is a measure of the vibrancy and resilience of Ireland that we continue to produce such wonderful talent as Roisin." Roisin's art was on exhibition at the Irish American Heritage Museum from May to August 2012. Her art provided stage setting for the Ireland Gateway to Europe Conference at Boston College in April 2016 and the Conscious Capitalism Conference in Bentley University 2011 and 2012. To date, the art has raised funds for the American Ireland Fund's Barretstown children's camp, Laura Lynn and Jack & Jill projects, Haven (for building houses in Haiti), The Irish Arts Center in New York and the Ireland Chamber of Commerce Albert Schweitzer Young Leadership Program.